It was in 1933, 14 years after the Association was founded, that the idea of the “Spot” Club was born. Whose brainchild was it? “Chris” Finney (Brooklyn) was the daddy. With his characteristic enthusiasm, “Doc” McLeod went all-out for the idea. Master salesman that he was, he knew a good project when he saw it. He talked over the plan with the dozen or more loyal and dedicated men who devoted many long hours to the welfare of N.A.C.A. (subsequently renamed IMA) and who had done so much for the Association during the first 15 years of its existence. He brought the idea of the friendly environment of those famous bull sessions in his office, where discussions, debates and good conversation flowed fast and furiously, and where many of the plans for the benefit of the Association first saw the light of day. It was obvious to this group of men that as N.A.C.A. grew and developed, a great number of talented people would serve as national officers and directors, and then pass from office when their terms ended-and a link was needed to bind these past officers and directors to the Association. Something was required, to capitalize in a more formal way, on the experience they had gained in building a powerful technical organization. Most of all, however and this is the phase that McLeod was perhaps more interested in than any other, an organization-within N.A.C.A.-was needed to help preserve and perpetuate the sincere friendship formed while these men were in office. Something was necessary to keep alive the interests, contacts and deep loyalties developed over their years of service to N.A.C.A. AND SO THE “SPOT” CLUB WAS BORN! X MARKS THE SPOT! The name? Believe it or not, it was sparked when “Chris” Finney and “Doc,” walking up Broadway, passed a theater which was showing a movie-X Marks the Spot. As part of the advertising for the picture a bold X was painted on the sidewalk at each corner of the street. Now the proposed club had a name, based on the idea that the group would be composed of ex-national officers and directors and the “Spot” was where they served N.A.C.A. This was one idea that practically sold itself. “Doc” carried his enthusiasm for the project to everyone he met, and on all sides he met complete agreement. At a meeting of the National Board of Directors in New York on April 14, 1933, Secretary McLeod reported on the results of a memorandum which he had sent to a number of past officers and directors “with a view to securing their opinions as to the desirability of establishing a club within the Association to be composed of past officers and directors.” On the basis of his report that all comments received had been most favorable, the Secretary was authorized to continue his efforts and to invite a group of past officers and directors to the next meeting of the Board for further discussion of the matter. The subsequent meeting of the Board was held in New York on May 12, 1933, at which time action was taken authorizing President Harry A. Bullis to appoint a committee “to take definite steps toward the formation of the Spot Club.” It is interesting to note that because of the absence of the then-current president, Past National President Finney conducted this meeting. The committee subsequently appointed by President Bullis consisted of Clinton M. Finney (Brooklyn), Charles R. Stevenson (New York), Val W. Collins (Mohawk Valley), Horace G. Crockett (New York), C. Walter Coapman (Rochester), Myron J. Hayes (Rochester), S. L. Whitestone (Albany) and “Doc” McLeod. “Chris” Finney was named chairman. The committee met in Charles Stevenson’s office in New York on December 29, 1933, and formulated a report which was presented to the National Board on January 12,1934. The Board approved the committee’s recommendations. The first official organization meeting of the Spot Club was held in a private dining room of the Hotel Cleveland, Cleveland, Ohio, on Sunday, June 24, 1934. The date coincided with the opening there of the National Conference, of which Logan Monroe was general chairman. 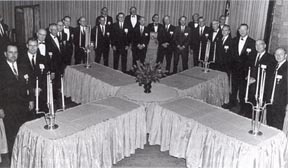 Fifteen persons were in attendance at this first meeting, when “Chris” Finney was elected as the first Spot Club president. Also elected were Frank Sweetser and Val Collins as vice presidents; Henry Fernald, treasurer; Addison Boren, Edmund Oerter and Thomas Frank, governors for one year; and S. L. Whitestone, William Castenholtz, Sr., and Carl Eveleigh, governors for two years. President Finney drew up the Constitution and Bylaws; and insignia for the N.A.C.A. seal was designed, and the Spot Club was launched. From the very beginning of the Association, the personality of “Doc” McLeod was an important factor in welding strongly the bonds of friendship and loyalty of all past national officers and directors. With the birth of the Spot Club in 1934, these links of loyalty were strengthened, and the new organization became an even more important factor in the development and growth of the National Association of Cost Accountants. A vast reservoir of technical know-how, administrative experience, talent and ability was now at the disposal of the Association. Spot Club members were used as speakers at national conferences and chapter meetings. Their wide experience was tapped for a greater flow of technical material for publications and research work. National committees for the various activities of the Association used this fund of ability to the utmost, for national conferences-chapter operations-chapter competition research publications. Wherever a need for any assistance developed, either at the national or chapter level, Spot Club members responded generously. All this was done, however, while conforming strictly with one of the original tenets of the organization-never to interfere with or attempt to influence the current Board of Directors, either at the national or chapter level. Members of the Spot Club considered it a privilege to serve and help and to be a part of the continuing growth of N.A.C.A. As a group they recognized the debt they owed the association for their own business progress and development, and for their growth as better human beings through this service. Activity wasn’t all work for Club members; there was a lot of fun in it, too. The Club was responsible in no small measure (probably the effect of the McLeod personality) for building a solid N .A.C.A. spirit-a spirit of good fellowship and fraternity that has served as the foundation stone for all progress made and has remained through the years. At his frequent visits to chapters with the national officers, “Doc” McLeod always went to great lengths to contact as many Spot Club members as possible and these get-togethers were truly memorable and remarkable occasions. The “big night” for Club members came at the Annual Spot Club Dinner, held each year in conjunction with the national conference. At this dinner, election of officers and induction of new members took place. A very impressive and dignified ceremony of induction had been developed by Val Collins (Mohawk Valley) and McLeod, and this was supplemented by a beautiful dining room set-up a table in the form of the traditional roses…and songs. (“Doc’s” favorite: Moonlight and Roses.) Everything added up to an unforgettable experience. Acquaintances were renewed, new friendships made, and a true spirit of friendliness, loyalty and good-will prevailed. This was the real spirit of N.A.C.A.-the spirit of the Spot Club. In January, 1957, “Jack” DeVitt, then president of the Spot Club, proposed the idea of changing its name to the Stuart Cameron McLeod Society. “Jack” has always maintained that “Phil” Warner was the one who first suggested the change, and that he and Logan Monroe simply “picked up the ball” and ran with it. “Jack’s” idea caught on like wildfire. Following extensive discussions among members of the Club, the matter was referred to a committee which, after much deliberation, brought out a report favoring the proposed change. A presentation made to the Executive Committee of the Association on March 1, 1957, resulted in adoption of the resolution of endorsement and support. At the National Conference in June 1958, the Spot Club members at their annual dinner meeting voted to change the name of their organization and thus the illustrious Stuart Cameron McLeod Society came into being.